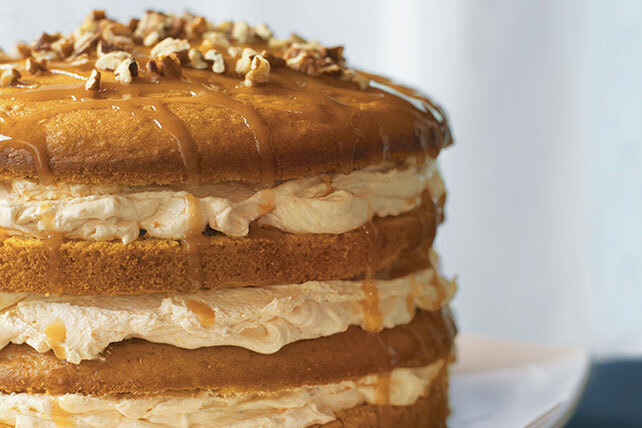 How do we make our famous Luscious Four-Layer Pumpkin Cake a Smarter Choice? With Neufchatel cheese and COOL WHIP Lite, that's how. Beat Neufchatel in medium bowl with mixer until creamy. Add sugar, remaining pumpkin and spice; mix well. Gently stir in COOL WHIP. Cut each cake layer horizontally in half with serrated knife; stack on serving plate, filing each layer with 1/3 of the Neufchatel mixture. (Do not frost top layer.) Drizzle with caramel topping just before serving; top with nuts. Small ingredient substitutions, such as PHILADELPHIA Neufchatel Cheese and COOL WHIP LITE Whipped Topping, result in a savings of 40 calories and 3g of total fat, including 2g of sat fat, per serving when compared to a traditional recipe.